PetFix performs spay/neuter surgeries on cats and dogs over 8 weeks of age and weighing at least 2 pounds. Feral cats in managed colonies are welcome. Feral cats need to arrive at the clinic in a humane trap between 8am - 9am, Monday - Thursday. No appointment is required for feral cat surgery. 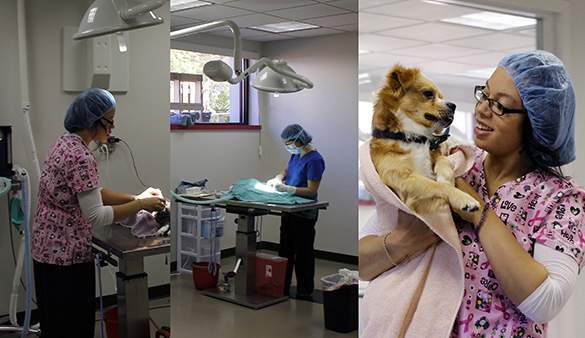 PetFix does not offer wellness or vaccine-only appointments; we offer vaccines only on the day of surgery. Please contact your full-service veterinarian for wellness and vaccine services. Prices (as of February 1, 2018) include a FREE cone/e-collar to prevent licking the incision area. All animals are also given pain medication at no additional charge. If you receive government assistance, please let us know when making your appointment. You may be eligible for a reduced surgery fee through limited grant funding.